As much as you’d like to forget your spotty past, your face remembers, in the form of scars. Whether they’re raised and red, flat or depressed, they don’t have to haunt you for the rest of your life anymore. Acne is a very common condition which in most cases can be treated successfully with the right course of action. Most likely it will eventually subside, however, the scars can remain for many years, even a lifetime unless treated. Luckily there are options available here at MK Aesthetics. 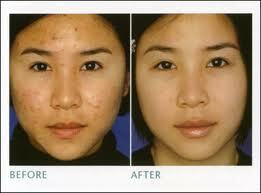 At our clinic, acne treatment is usually a 2 stage approach. Firstly it is important to calm down the active flare-ups of acne in order to prevent further skin damage. Secondly, we address the existing damage resulting from the inflammation, which is usually in the form of scarring or what is called Post Inflammatory Hyperpigmentation, often seem in Afro-Carribean and Asian skin. We have a variety of treatments to treat both the active inflammatory disease, in this case, Acne, and the after-effects (scarring/hyperpigmentation). For active acne, we recommend topical treatment as well as the Lustre PureLight System, which is a new blue light technology for porphyrin oxidisation. It is exclusive to MK Aesthetics in Milton Keynes. For acne scarring, we would recommend skin peels such as the Obagi Blue Radiance or TCA Peel; Dermapen (microneedling) or the Obagi Nu-Derm System. Lustre Pure Light System is a simple and straightforward treatment developed by leading dermatologists and takes just 20 minutes. Firstly the face is cleansed and dried before the handpieces are applied to the areas of the face to be treated. There is no pain or discomfort just a gentle, warm sensation. It is very effective for acne and acne scars equally. It has been designed for patients to use at home between clinic-based treatments to assist and accelerate the outcome. Depending on the severity of scarring, the treatment is to be carried out on a case-by-case basis. A skin peel may be part of the course of treatment for those who have deep scars. A TCA peel, trichloroacetic acid peels or a phenol chemical peel may be able to resurface the treated skin enough to eliminate the appearance of acne scars. Any of these peels are generally a single session application, which takes around 10-12 minutes. During the treatment, you may experience a slight burning sensation, but no anaesthesia or sedation is required. When TCA is applied to your skin, the chemical causes the top layers of skin cells to dry up and the damaged skin starts to peel away after about 3 days, often continuing up to 7 days. After this, new healthy skin is revealed. Dermapen (Micro-needling of skin) is another option for achieving smooth scarless skin. In this procedure, your practitioner may use a topical anaesthetic to numb the skin making the procedure comfortable. It takes up to 30 minutes for the topical anaesthetic to work and 20 - 30 minutes for the actual treatment. All these treatments are safe and very effective with minimal risk and downtime. After the Lustre treatment, skin may feel a little sensitive in the treated area(s) and look a bit red, but this will soon calm down and return to normal within 15 minutes or so. After having a TCA peel or Dermapen micro-needling treatment your skin will be especially sensitive to sunlight. Mild to moderate swelling of the skin may appear but this is temporary and will resolve over two to three days. With a TCA peel, we recommend that you use sunscreen and stay away from direct sunlight for a week or two before treatment. The downtime for a TCA peel is 3-7 days depending on the depth of chemical penetration, as the new layer of skin appears 3 - 7 days after treatment. About two weeks after the treatment, the skin will be fully healed. You will be more sensitive to sunlight for 4-6 weeks after treatment so better to avoid sun exposure for a few weeks. Strenuous exercise and heavy sweating should be avoided for 2-3 days. Lustre pure light treatment is safe and very effective, with minimal to no side effects. The treatment is ideal for patients who want an accelerated result from their acne treatment or those who may be concerned about the downtime of other treatment options. It is a small, rechargeable device with slim, flexible therapy heads, targeting the problem areas only. 1) Common risks are redness, bruising, crusting or swelling, but all of them subside after 1-2 days post-treatment. 2) There is also a risk to the eyes, during skin peels. You will be given protective eyewear and instructed to keep your eyes closed throughout the duration of your treatment. 3) Skin infection, discolouration, bumps or nodules are very rare. At MK Aesthetics clinic, we offer different skin treatments and products to help you look and feel your best. The treatments are great for those who opt for a non-surgical option to combat lines, wrinkles, acne and scarring. The lustre pure light pro is a very effective treatment for acne and acne scars. Many people struggle with acne, be it mild, moderate or severe and may have been in circles trying to find the right treatments, medication and/or products. Most people know now that whilst very relaxing and pampering, salon facials don’t really cut it and the acne medication, despite being very effective may be the last resort due to its side effects. Lustre Pure Light Pro is best when used for at least for 2 weeks, to see the desired results. After a TCA peel treatment when the old skin has peeled off, it exposes a new layer of skin which has a smoother texture and a more even colour, and a reduction of scarring. More than one treatment may be necessary. Another option for deep acne scars is Laser Skin Resurfacing. After Dermapen Micro-needling therapy, your skin will start to naturally regenerate and repair itself, working deep below the surface, in the dermis. Even though you will see results within a few days, the full results can show themselves in approximately 6 weeks, as the new collagen and elastin are formed and new skin cells are generated. To achieve the best result you could have a course of 4-5 sessions, depending on your skin goals and concerns. Dr Goyal, Skin Doctor and GP, runs the MK Aesthetics clinic in Milton Keynes. He is also a dermatology doctor/GP partner at a practice in Milton Keynes and part of the dermatologist team in Bedford Hospital. Dr Goyal is certified to carry out all the treatments offered at MK Aesthetics. A specialist in the field of Cosmetic Medicine, you can be sure you’ll be in safe hands.